The son of a wrestler turned cycling coach called Killer Kowalski, Rob Hayles was soon winning races himself and realizing that he didn't really want to work for a living. The world of amateur club cycling in the 1990s was a long way from the millionaire sport of today though. When Rob first rode for Great Britain, it was with his own bike, one spare tyre, and a hand-me-down jersey. Yet Rob became an integral part of the amazing success story of British cycling, and has been at the centre of the sport for the past two decades. With Bradley Wiggins, he was a member of the first GB team to become world champions at the team pursuit, the most demanding and thrilling discipline on the track. With teammate David Millar, he witnessed first-hand the drug-strewn, often demeaning life of the professional road cyclist. 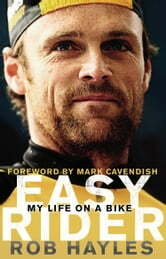 And as Mark Cavendish's training partner, Rob has been the experienced influence at the side of the fastest man on two wheels. Easy Rider is an unforgettable journey through revolutionary times. Sharp, down-to-earth, packed with anecdotes and just plain fun, it takes you from the humblest of beginnings through a golden era in British cycling.